Quick finish this sentence I loooove fettuccine _____! The sauce is so good and creamy and just delicious right? Unfortunately, it's also not too healthy and very fattening especially when it's from a jar, which is where most of us get our Alfredo sauce from. However, the other day I was on Instagram and saw someone post a healthier version of an Alfredo sauce made out of avocado. Let me be the first to tell you I used to HATE avocado as a child but now I love them! There are super healthy and versatile as this recipe proves. Place the peeled and pit free avocado in the blender, add garlic SLOWLY, quarter cup of plain Greek yogurt, table spoon of olive oil and blend until smooth. Add in milk to make consistency smoother. You will have to scrap the sides and bottom to make sure all of the ingredients and equally blended. Add salt and pepper to your liking and enjoy! 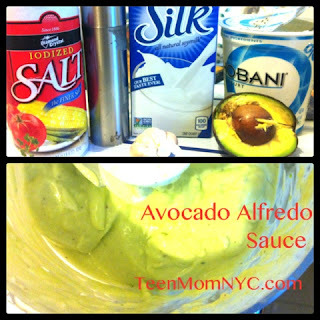 Turn your avocado "Alfredo" sauce into a dressing by adding vinegar to it and enjoy it on a salad. You can also use it as a dressing for a sandwich.